If you were one of the many anglers that helped contribute to this number, stand proud! Congrats to all anglers for helping us achieve this! All of these numbers can be found on our daily fishing reports HERE, where you can search by date, boat, or even species. A disclaimer that not all 9 boats of the fleet fish everyday either. A large portion of these numbers come in the people season January-June, and then again October-December, so these numbers truly are spectacular and made for a lot of rigged bait! A new member, Poco Loco, is added to the Casa Vieja Lodge Guatemala Fleet. 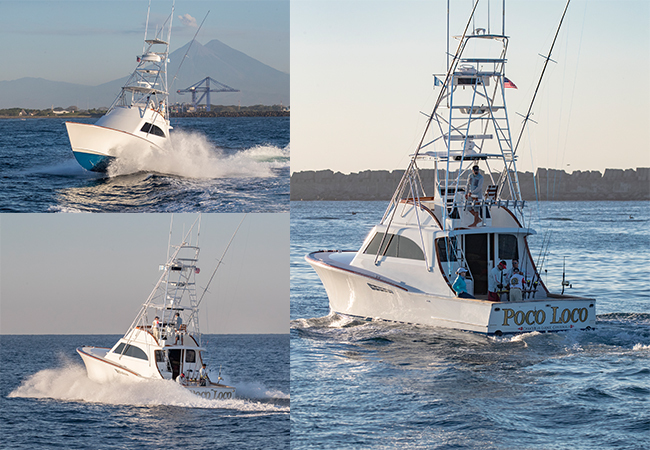 The Poco Loco, a 44’ Kincheloe Nickerson, built in 1989 in Stuart, Florida is available for charter for the 2017-18 fishing season at Marina Pez Vela, Puerto San Jose, Guatemala. At 44’ feet the Poco Loco is the largest boat, and sixth classic wood hull in the Casa Vieja Lodge Fleet. Debuting as the King of the Fleet, this 44’ Kincheloe Nickerson, boasts a maximum speed of 33 knots, a cruising speed of 25 knots, 2 staterooms, and an open salon. At the helm, Owner of Casa Vieja Lodge, Captain David Salazar, will navigate the Pacific Ocean in ease with a triple SIMRAD HD Display NSS12 evo3 and Halo-4 Radar, making time even better spent on the water. 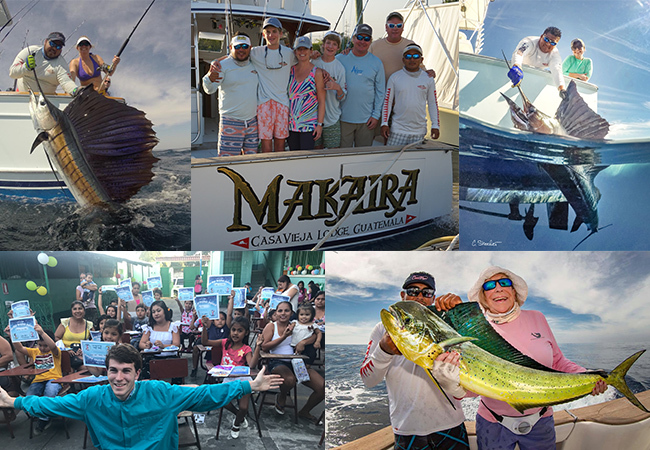 If you are interested in fishing the world’s most lucrative billfish grounds, look no further than Casa Vieja Lodge on the Pacific Coast of Guatemala. With an average of 12-15 sailfish raises per boat per day, double and triple hookups are of the norm. Experience 5-star angling with an elite group of captains and mates that do more than just hand you the rod, they teach you how to fish. Since 1958 AFTCO (American Fishing Tackle Company) has been leading the industry in fishing tackle. In 1989, AFTCO entered the clothing division. AFTCO is still a family business like Casa Vieja and in 2018 Casa Vieja Lodge has partnered with AFTCO to produce custom CVL Samurai Performance long sleeve shirts. Your favorite boating shirt just got better with AFTCO! 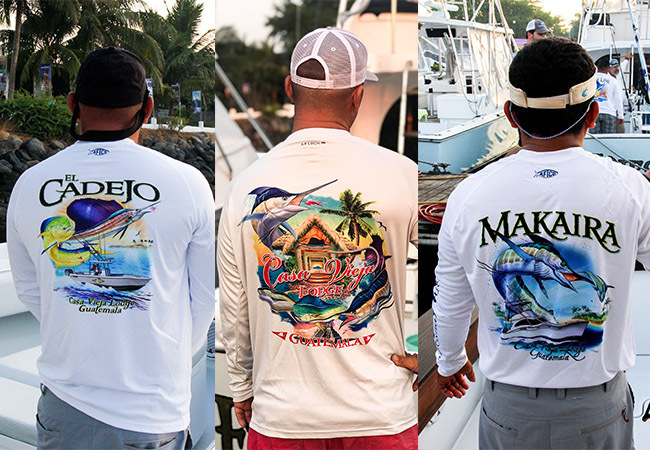 AFTCO Samurai Performance Shirts are NOW available in all 9 boats, plus a new CVL lodge design by Alan Woolford, at La Tiendita at Casa Vieja Lodge. Be the first to have the new Samurai Performance shirts this season. The highly anticipated Poco Loco design will be available by the end of the month. Add these new shirts to your collection and feel the AFTCO difference! Online sales will be available soon enough! Welcome 2018! It’s time for the billfish to wake up and come out and ring in the New Year! One thing is certain, it’s a balmy 85 degrees and will remain that way throughout the winter! The Golden group has been spending New Year’s Eve at the lodge for close to 10 years now. This year was different when Josh Golden an aspiring dental student brought 100 dental kits for local children. He presented an educational slideshow of the importance of dental hygiene. As always below are some fishing highlights and you can see the daily fishing report HERE. Fishing December 20th & December 28th-January 10th, the Afinity (39’ Billy Knowles) with Capt. 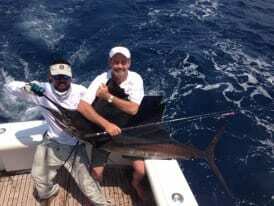 Nico Melendrez, had 143 raises, 103 bites, and 67 sailfish releases. They also had 1 marlin raise, 1 marlin bite, 1 marlin release, 2 tunas, and 12 mahi-mahi! On December 21st, the Finest Kind (40’ Whiticar) with substitute Capt. Chris Sheeder, released 8 sails on bait, 2 on fly, a striped marlin AND a blue marlin…GRAND SLAM! 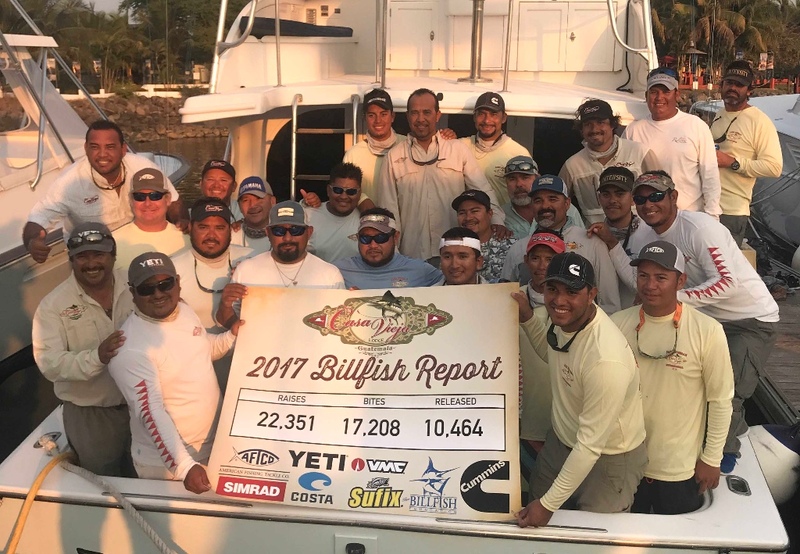 From December 27th-January 10th they had 174 raises, 109 bites, 60 sailfish releases. They also had 3 marlin raises, 2 marlin bites, 1 marlin release, AND 10 mahi-mahi. December 27th-January 10th, the Intensity (37′ Gamefisherman) with Capt. Mike Sheeder, had 87 raises, 55 bites, and 37 sailfish releases. They also had 11 marlin raises, 2 marlin bites, 1 marlin release, 4 tunas, and 3 mahi! December 27th– January 10th (fishing 8 days), the Spindrift (38’ Stolper) with Capt. Nicho Alvarenga, had 110 raises, 67 bites, and 45 sailfish releases. They also had 1 marlin raise and 8 mahi-mahi. December 28th-January 10th, the El Cadejo (35′ Contender) with Capt. Efron Rizzo, had 50 raises, 38 bites, and 21 sailfish releases. They also had 2 marlin raises, 2 marlin bites, 2 marlin releases, and 7 mahi-mahi! December 28th– January 10th, the Release (37′ Merritt) with Capt. Chico Alvarenga, had 107 raises, 76 bites, and 48 sailfish releases. They also had 1 marlin raise & 8 mahi-mahi. December 28th-January 10th, the Makaira (37’ Rybovich) with Capt. Jason Brice, had 133 raises, 113 bites, and 69 sailfish releases. They also had 6 marlin raises, 4 marlin bites, 2 marlin releases, and 10 mahi-mahi. January 1st-3rd, the Pez Raton (35′ Contender) with Capt. Franz Hoffman, had 40 raises, 36 bites, and 9 sailfish releases. They also had 6 mahi-mahi! PreviousPrevious post:Stress-Free Holidays at Casa Vieja LodgeNextNext post:Double-digit Raises AND Releases!